Across Israel, thousands gathered to pray together for the recovery of Rabbi Yosef Shalom Elyashiv. His condition is now serious but stable. Thousands of people gathered on Monday night at the Western Wall to pray for the health of Rabbi Yosef Shalom Elyashiv, considered the leader of the Ashekanzic Orthodox community worldwide. They were joined by thousands more in yeshivas and synagogues around the country. Dozens gather outside Rabbi Elyashiv's room in Shaare Tzedek Hospital, keeping a vigil over the aged sage and praying for his recovery. 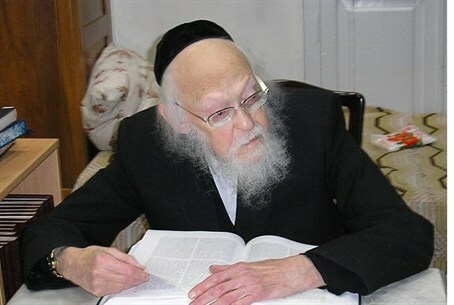 The 101-year-old rabbi was hospitalized on Sunday after he felt ill. When he was taken to the hospital he was suffering from shortness of breath and low blood pressure. His lungs were cleared of some liquids that had gathered there. A crisis developed on Monday evening, his condition deteriorated rapidly and was defined as critical. Doctors managed to revive the rabbi, who has been sedated and placed on a ventilator to help him breathe. MK Moshe Gafni, chairman of the Knesset’s Finance Committee, who came to visit Rabbi Elyashiv, told Arutz Sheva late Monday night that the rabbi’s condition had improved slightly and that he was now considered to be in stable but serious condition.